who can then pass it on to your New Tenants. Whether you are moving in furniture or only personal belongings (so the Porter on Duty can assess and arrange for the lift to be protected by padding, provide door stops, supervision, and a trolley). 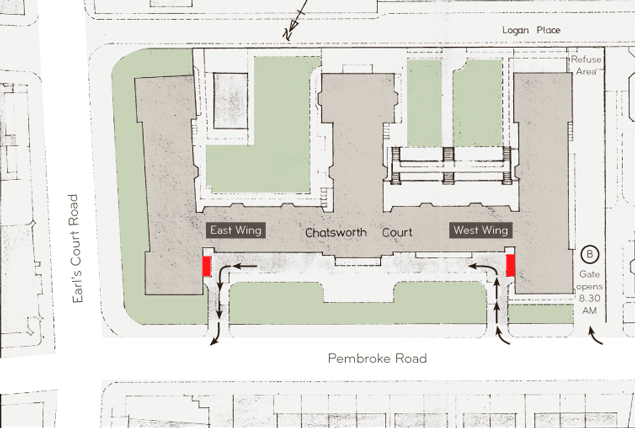 The best way to move in, is to park in area marked in red and use the stairs. This is subject to the Van/Vehicle not obstructing the exit. If the vehicle is a Lorry and too big to fit in the marked area, it must then park in the area marked ‘B’. The lift is not built to carry furniture, as it is simply a people carrier. A larger lift is now available, its use needs to be coordinated with the Porter. Please make arrangements accordingly. Considerable noise and disturbance is also caused by tenants /residents moving in and out of apartments. Consequently it is advised that only in exceptional circumstances and with the written permission of the Managing Agent will removals be permitted outside of the hours 08.30 – 17.30 Mondays to Saturdays. The lifts are delicate machinery, and if not treated as such, break down and could cause considerable inconvenience, as well as unwarranted service charge expenditure. Do not hold a lift on your floor for extended periods as this will damage the mechanism and inconvenience others. The lifts are for the transportation of residents and their guests only, if you have a heavy object that needs to be taken to your flat, please inform the porter and he will evaluate the load to stop any potential damage to the lift.